There is no doubt, whomever visits Venice will cross it many times. The Rialto Bridge is the most famous most admired, and in a sense represents the geographical center of the city. 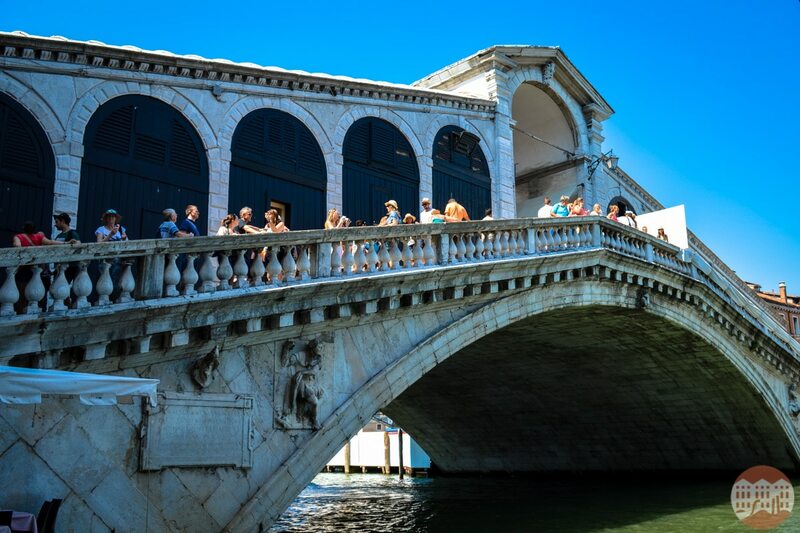 This architectural masterpiece of late fifteen hundreds, designed by Andrea Da Ponte, isn’t just a symbol of Venice it is also an essential way to connect the two sides of the island. Therefore allowing everyone to cross the Grand Canal in a most spectacular way. In every corner indications are found to reach it and is a must in almost all Venetian itineraries. A few steps from the fish market, on one side, is the splendid Campo San Polo and on the other is the strategic Campo San Bortolomio. The Rialto Bridge maintains its charm with every step and offers each time a different reason to fall in love. Surely you will cross it many times, but to really enjoy its beauty – and its incredible panorama offered by the peak of the bridge’s arch – there are moments that are better than others. If in fact you can avoid the central hours of the day: the bridge is heavily travelled. So if you are early risers, at sunrise or the early hours of the morning, the Rialto Bridge reflects a particular light, above all in its central section that in the silence of the city takes on an almost mystic atmosphere. Towards the evening instead, you can’t miss facing the west side where the sun dives in the Grand Canal, giving us one of the most exclusive sunsets of the city. In the still of the night instead, the Rialto Bridge awards a romantic stroll along the lights of Ruga degli Oresi. When crossing the Rialto Bridge you probably won’t be able to perceive all the architectural beauty of this masterpiece. Here then are some suggestions to take full advantage of the marvel of this masterpiece. By waterbus, by gondola or by water taxi: a passage “under” the bridge is obligatory in order to grasp the grandeur of the project and the hues of white stone it was built with. Coming from its eastern entrance, hone your sight to uncover a small passage from campo dell’Erbaria that runs along Palazzo dei Camerlenghi: you will find yourself at the foot of the bridge, but from a not so common prospective. To enjoy the Rialto Bridge in a larger context, we suggest you get as far as Palazzo Fortuny, a few steps from where you can find a large wooden dock that leads a couple meters in the Grand Canal: seen from there the Rialto Bridge will remain engraved in your mind forever.